Long Weekend Offer - Buy 2 Get 1 Free On Entry Tickets at Adlabs Imagica. Use coupon code to avail this offer. Save 33% on Regular tickets to Theme Park. Valid for visits from 17 - 21 Apr only. Every third ticket, of lowest value, in your cart will be free! Buy PizzaHut e-gift voucher and get flat 20% instant discount at Familyjoyz. No coupon code required. Hurry!!! offer valid for limited period. Buy entertainment deals from Essel World & Water Kingdom on Little App and get 40% cashback. Use Little App coupon code to avail discount. Hurry! Offer valid for a limited period only. Book your aquamagica's tickets in advance and get 10% off at Adlabs Imagica. Minimum booking of 5 tickets. No coupon code required. Adlabs Imagica is India’s first and only International standard Theme Park, offering fun, action, entertainment, dining and shopping at a single location. Adlabs Imagica is no ordinary theme park. Save Up to 58% on Adlabs Imagica annual super saver pass. No coupon code required. More detail on the landing page. Book langkawi 3 nights/ 4 days starting from Rs.6548 at Via.com. Book Beach Holidays Starting From Rs.30,259. No coupon code to avail this offer. Beach holidays are a perfect getaway for anyone who is a nature lover and who has the fascination to absorb the beauty of our planet. Book Honeymoon Holidays Starting at Rs.62,719 at Holidayme. No coupon code to avail this offer. Choose destinations for their honeymoon tour package - Switzerland, Italy, Greece, Thailand, Malaysia, Bali, Singapore. Book Greece Tour Packages starting at Rs14,439 at Holidayme. No coupon code required. Grab this offer and get big saving on your holiday package. Get the family package from Mumbai to Alibaug @ Rs.4227 at Jetfleet. No coupon code is required. Hurry!!! offer valid only fro a limited period. Get the family package from Mumbai to Lonawala @ Rs.4157 at Jetfleet. No coupon code is required. Hurry!!! offer valid only fro a limited period. Get the family package from Mumbai to Silvasa @ Rs.6461 at Jetfleet. No coupon code is required. Hurry!!! offer valid only fro a limited period. Go Swadesi Sale - Flat 10% off on domestic packages at Akbar Travels. Booking validity: 30th April 2019. Use best offer code to avail this offer. More detail on the landing page. Centara Grand Island, Maldives - Ultimate all-inclusive Maldives with overwater villa upgrades available at Luxury Escapes. Promo code not required for this offer. More detail on the landing page. Hotel In Goa - The Park Baga River Goa 3 or 4 nights at Rs.16855/room at Luxury Escapes. Coupon code not required for this offer. 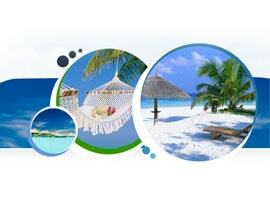 Luxury Escapes Offers - Get hotels & resorts deals starting at Rs.12686 at Luxury Escapes. Coupon code not required for this offer. Give us your email so we can send you Holiday Packages Coupons once a day and our biweekly newsletter. It is more convenient to look for holiday packages if you are planning a vacation with family. You can use holiday packages coupons available here to save an extra amount on your overall spent on any vacation. These packages can be sometimes costly and you must be worried about your budget. You can look at various online travel websites that will favour you with all your needs including MakeMyTrip, NearBuy, Yatra, Musafir, FlyWidUs etc. All these sites help you with amazing holiday package deals which you cannot deny. All you need to do is to fix your destination and then look here for holiday packages with flights to your destination. You can save on your budget with cheap holiday packages even during the peak season with the help of these travel sites. There are several holiday packages online and you can choose the one within your budget if you are not specific where you want to go. Here you can find all the latest deals on holiday packages to domestic as well as to International destinations. Make use of the relevant coupons available here to enjoy extra discount on your spend while booking.